Whether you are discovering Stoicism for the first time, or are a long time student looking to dive deeper into the philosophy, finding the right books can be difficult. 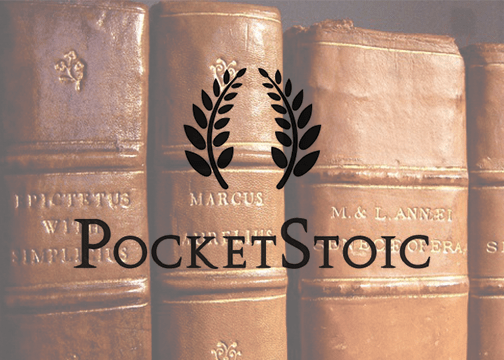 The team at PocketStoic (who include as collaborators several Stoicism Today project members) has organized a giveaway to help you build your bookshelf and dive deeper into your practice. You can enter the giveaway here. We’ve been asked several times how we choose the books that we’ve included in the giveaway… So we thought it would be easiest to take them one by one and tell you why we think they’re worth reading. Let’s start with some recent works engaging with and interpreting Stoicism in a modern setting. Why it’s essential: Perhaps the best-known introduction to Stoic philosophy, Guide to the Good Life is an immensely readable, jargon-free guide to Stoicism as a practical life philosophy. Covering a wide range of wisdom and techniques, Irvine lays out a modern framework with the goal of attaining tranquility and joy in life. While some traditionalists have criticized the book as re-interpreting certain principles, Irvine himself points out that the Stoicism is anything but static dogma. For those interested in Stoic philosophy, Guide to the Good Life is the place to start. It’s truly a modern classic. Why it’s essential: Drawing from the wisdom of the ancient Stoic philosophers, Donald Robertson’s Stoicism and the Art of Happiness is one of the most in-depth “how-to” guides for implementing Stoicism into daily life. Utilizing his background as a CBT therapist, Robertson includes a variety of exercises based on modern behavioral research, while never losing sight of the traditional practices and teachings of his Greek and Roman Stoic predecessors. Why it’s essential: While not a modern work per say, Sharon Lebell’s interpretation of Epictetus’ Handbook is a great read for those looking for a quick and effective dose of Stoic wisdom. Written in modern, colloquial language, each page of The Art of Living employs a single directive, followed by (sometimes liberal) interpretations of Epictetus’ timeless advice on living well. Lebell has crafted a great update for those looking for an uplifting read to keep on the bedside table. Why it’s essential: Though Becker’s treatise on Stoic ethics is admittedly more dense than the above titles, his defense of traditional Stoic ethics as a structure for living well in the modern world makes for a fascinating read. Written through the lens of modern science and psychology, A New Stoicism may not be a casual introduction, but it’s nonetheless great for those looking to enhance their understand of Stoic ethics and logic. Why it’s essential: Found on the bookshelves of everyone from entrepreneurs to professional athletes, Ryan Holiday’s bestselling The Obstacle is the Way presents Stoic philosophy as a no-nonsense set of tactics for dealing with adversity and increasing mental toughness. Holiday illustrates these techniques through a variety of historical examples, recounting stories of figures who embodied Stoic ideals to triumph over personal and professional challenges. A more energetic introduction than Guide to the Good Life, those looking to build a powerful arsenal of Stoic techniques will find Obstacle the perfect playbook. Why it’s essential: Although the word Stoic only appears a few times in this book, the philosophy of Stoicism is everywhere. Ryan does an amazing job of telling stories of how ego can impede decision making and blind you. Why it’s essential: Marcus Aurelius never intended the Meditations to be published. Through his self-discourse we get to see inside the mind of one of the most powerful men in the world, and learn more about his struggles to lead a good life. Why it’s essential: The Discourses are compilations of the teachings of Epictetus. He taught that happiness is an attainable state of mind instead of an occurrence. Stoicism is a philosophy of choice, and Epictetus highlights every occurrence where we have the ability to choose our reactions. Why it’s essential: Epictetus believed that “no man is free who is not master of himself.” In the Enchiridion he dives into the practical precepts that are useful to apply to your everyday life. Why it’s essential: Seneca’s reasoning derived mainly from the Stoic principles. In his Letters he dives into the practical applications of his principles in spite of challenging circumstances. He conquers topics from the wisdom of the self-possessed person immune to overmastering emotions and life’s setbacks. Why it’s essential: One of the most unique and enlightening reads on modern Stoic practice, Stoicism Today is a collection of essays from people across the world who have incorporated Stoic philosophy into their lives. The variety of viewpoints makes the collection instantly relatable, and many of the writings show Stoicism’s power in helping people find joy, tranquility, and in overcoming even the most difficult situations in life. Sean O’Connor has dedicated his career to helping people level up in life. He’s an edtech product manager and marketer who writes about philosophy every week with Stoic Sundays. He is also a member of the PocketStoic team. Next Next post: International Stoic Week – Call For Events!